Any synth-buff will tell you that a VCO is quicker than the minimum decay rate on an SH-101 envelope, but an ACO? That’s a rarer beast, and exactly what Sonicsmith have decided to put at the heart of the Squaver P1+. The Squaver P1+ (hereafter simply known as P1+) is a single-oscillator, monophonic synthesizer in a boutique guitar pedal. Despite its guitar centricity, it could work just as well in a modular synthesis setup thanks to a generous scattering of modular-style CV, gate and audio I/O. ACO stands for Audio Controlled Oscillator, which means that the pitch of the oscillator is controlled not by a keyboard or a sequencer, but by an audio signal. It could be anything: guitar, clarinet, whistling, drum loop, Mongolian throat singer... you get the picture. For accurate pitch-tracking, the signal must be monophonic with a strong fundamental frequency, so a clean un-amplified guitar works well, but only when playing a single string. 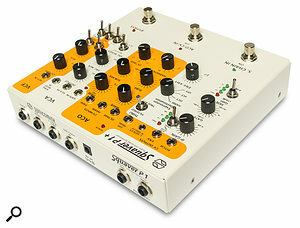 The synth voice itself uses a custom analogue chip, which Sonicsmith call the ACO100. The chip produces a sawtooth or pulse waveform with a control to blend between them. Pulse width can be modulated either with a dedicated control, a CV input jack, or an on-board envelope follower. There’s a sub-oscillator which can be blended between -1 and -2 octaves and, finally, two controls allow for transposition of the synth voice in semitones (-7 to +5) and octaves (-2 to +2), allowing you to create harmonies against the fundamental pitch of the incoming signal. The transposition controls have their own CV input jacks and can also be controlled via an expression pedal input — note though that this is not the same as having a 1V/oct pitch control. A resonant multimode filter allows for further tonal variation. Low-, band- and high-pass modes are on offer and can be switched from 12 to 24 dB/octave. The cutoff can be controlled either manually, via CV input or with the envelope follower. There’s no information in the manual about the filter type; to my ears it has an SEM quality to it, but perhaps that’s only because it doesn’t self-oscillate. While the P1+’s front panel is laden with 3.5mm CV and gate connections, quarter-inch audio I/O sockets are found at the rear.There are two envelope followers, one derived from the amplitude of the main signal, and a second one which follows a line-level input on the rear of the unit. Only one can be used at a time, with the leftmost footswitch toggling between them as the source for both the internal routings (VCA, PWM or VCF) and a CV output on the front panel. The other two footswitches control enabling and disabling the CV inputs for Harmony (semitone transpose) and Octave, and a global bypass. A typical scenario would be this. Plug your guitar into the main input, adjust the input level, filter and gate to get accurate tracking, set up the synth section and filter to taste, and assign the envelope follower to maybe VCA and VCF. The result is a monophonic synth lead with an auto-wah filter effect that follows the pitch and amplitude of your guitar playing. You can mix between the original signal and the synth voice. You might add an expression pedal and route it to the Octave control, which would allow you to transpose the synth voice by -2 to +2 octaves. The pitch tracking of the P1+ works about as well as similar tracking devices I’ve come across. The Korg MS-20 for example has a similar frequency converter, as does my Analogue Systems modular. Comparing the three systems for pure pitch tracking, there isn’t a clear winner. The P1+ tracks well over at least a couple of octaves given a suitable audio signal. There is sometimes a certain voodoo to creating a reliably trackable signal, but the P1+ manual has a good list of tips. If you only used the P1+ for guitar tracking, you might be missing out. Experimentation is clearly part of the ethos. I got some great results running drums and percussion through the P1+. The pitch tracking, of course, couldn’t cope, but the combination of wildly varying pitch and dynamic envelope following made for some very interesting sounds which I liked a great deal. It is perhaps missing the point to say that the P1+ should have included a 1V/oct CV input, but I can’t help feeling that it would have opened up the possibilities. I have a few other niggles with the synth architecture too. There’s no way to adjust the level of the oscillator going into the filter, and it overdrives almost all the time. 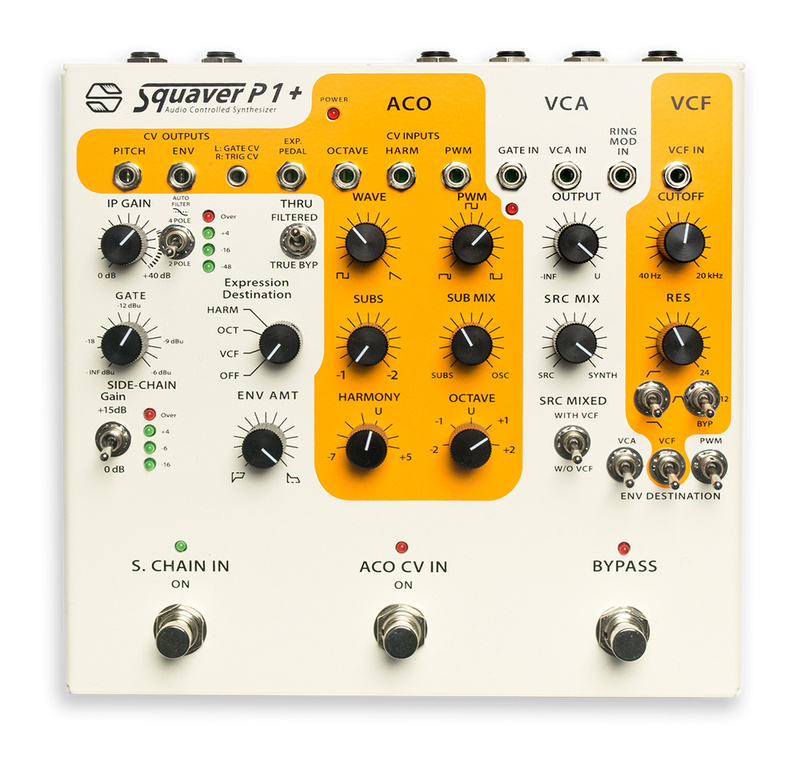 There was clearly audible clock noise coming from the oscillator circuit in the review model, and lastly I can’t help feeling that, at the price, the P1+ could do with some more sound-design tools like an LFO or a noise source to expand the sonic potential. Overall the P1+ is well built. The case is solid metal and the switches all feel sturdy. At this price range, I would have liked to see panel-mounted pots, though. For instrumentalists looking for a way to create monophonic synth leads or basses without playing a keyboard, the P1+ might be a great solution. Its additional modular-style CV and audio connectors certainly encourage inter-device experimentation, but you don’t often see guitar pedalboards with a lot of CV patch cabling and I feel like this could be both the P1+’s strength and its Achilles’ heel. Whether it appeals to both the guitar and modular markets, time will tell. It certainly wouldn’t be your first guitar pedal, nor your first synth, but if you’re looking for something to bridge the gap between live performance instrument and synthesizer, and you have a penchant for modular sonic experimentation, it is worth investigation. No MIDI or 1V/oct CV pitch control. Could be time-consuming to set up in a live environment. Obtaining accurate pitch-tracking can be a dark art. The price to synth ratio could be better. The Squaver P1+ is niche item by design. It’s an interesting proposition both as a synthesizer and a guitar pedal, yet it doesn’t feel entirely comfortable in either camp. Its combination of features is fairly unique though, so if you’re in the market for a pitch-tracking-oscillator guitar pedal, and you’re not put off by the price tag, then it should be on your list.